Want to have a look at Apple’s new tablet? If you want to get a good idea of the capabilities and looks of Apple’s new tablet, then have a look at this post, which I wrote last year, in September. At that time, I was thinking about a nice, large iPod — which is basically what the iTablet will be — in addition to much more, of course. But the core idea is the same. 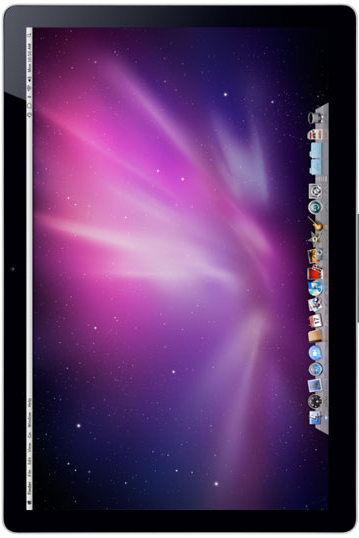 It bridges the gap between the desktop or laptop and the iPod. It’s a larger device on which we can consume media (news, photos, videos, music, etc.). And I bet it’ll come with some awesome speakers, just like the MacBook Pro laptops, and it will likely also stream music through AirTunes. Speculation aside, I can’t wait to see the real thing later this week. I don’t know what to say ! its really WOOOOW..